I travelled down early Saturday morning as my race was at midday, this gave me time to get round the hundreds of spectators to get a glimpse of the bike and run course. The course was already packed with age group athletes racing, as the first wave started at 7.00am. 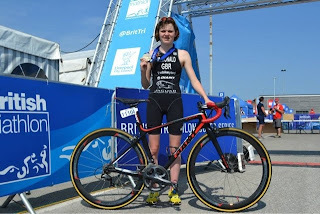 The race was a 400m square swim in the queen’s dock, then a long run to and from transition onto a 10km flat road circuit, twice out and back on the bike. Finishing with two laps of a flat 2.5km run. With triathlon having a ruling of wetsuits being banned when temperatures are above 20 degrees this was soon confirmed in the race briefing at 10.00am. 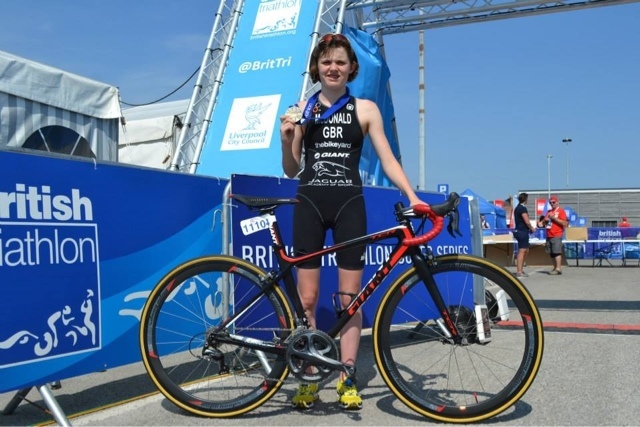 I prefer to swim in a wetsuit for extra buoyancy but I didn’t have time to worry as I was straight into transition to rack my bike. My race was at 12.30 pm which was 10 minutes after the youth boys start time this gave the girls a chance to find the best positions on the pontoon. The hooter for our race was suddenly sounded, which came as a big shock to everyone as there was no countdown but I soon got my head down and was off. Heading up to the first buoy I found myself in a group fighting for the best position. Three girls soon had a 15 meter gap on me so my aim was to try and close this as much as possible before heading into transition. I exited the water around 13 seconds behind the leading three. I had a good first transition heading out on the bike in 4th place, soon closing the gap and catching the lead group by the first turning point with around 8km to go. We had a chasing pack of around 8 girls behind so we needed to keep the pressure on. I tried a number of times to attack the other girls and managed a small advantage entering T2. Exiting T2 I was in equal 1st place shoulder to shoulder with Elizabeth Hood, 10 seconds behind was Sophie Alden. All three of us had been part of the GB team competing in the Europeans Youth relays. The first 1.25k was a comfortable pace so when the bell rang for the final half of the run it was time to try and up the pace. I kicked hard and slowly increased the gap from myself and Elizabeth. One advantage from the run being an up and back course you can see the other competitors so I knew how much time I had on second position. I kept up a high pace for the second lap to finish as British champion for my second year The final standing‘s were 1st Megan McDonald in 35.33, 2nd Sophie Alden in 35.53 and 3rd Elizabeth Hood in 36.06. After my race I was interviewed for the first time which was exciting and thankfully I had recently had my first media training with Jaguar academy of sport. This was a huge help as a found the interview went well and I didn’t stumble to much on what I was saying.